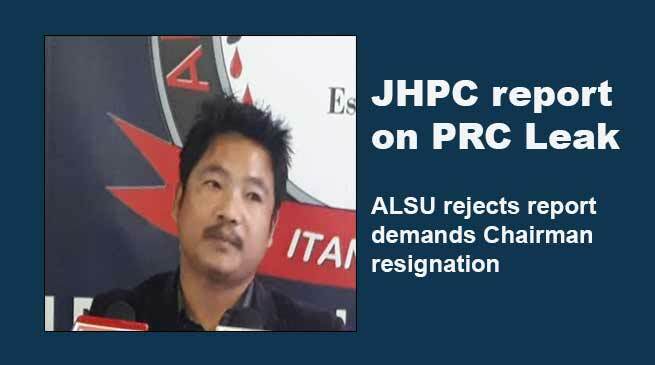 ALSU rejected JHPC draft report on PRC, demanding JHPC chairman resignation before submission of report to government. The Arunachal Law students union (ALSU) on Tuesday rejected the report compiling by Joint High Power Committee (JHPC) on PRC issue expected to be tabled in the ensuing legislative assembly while arguing that the committee recommendation is completely “futile” in nature as such the PRC issue needs to be explored further involving opinion of all stakeholders. A leaked copy of the JHPC draft report furnished to media by ALSU, and now doing rounds in various social networking reads that ” PRC may be issued to the Non APSTs/ex-servicemen or their descendants of Namsai and Changlang districts who have settled there prior to 1968. However, the committee in its report ensured that PRC will not confer any benefit or right to Non APSTs as par with Indigenous populace nor they can claim APST status at any point of time in the far future. In this connection, the ALSU while expressing “dissatisfaction” and “shock” over the report has sought the immediate resignation of the chairman, JHPC on moral ground before submission to the government. Addressing a press conference here at Arunachal press club, its president, Yurum Tamin said that they are unhappy with the report as the committee failed to come up with proposals that ensure indigenous copyright and to protect its interests and identity. Categorically stating the indigenous populace will not share any inch of land or rights/ privileges with outsiders, Tamin also called for implementing the Article 371A and Article 371G on top of BEFR act,1873 now enforced in states of Nagaland and Mizoram in the state, which ensures that no Act of Parliament shall apply to these states when act is active in terms of ownership and transfer of land, religious or social practices of indigenous people. Expression fears that if PRC is issued to Non-APST today, then their descendants might claim ST status in near future, Tamin apprehended wider ramifications with a potential to impact ethnic groups and their identity if PRC is issued to Non-APSTs. The ALSU further warned that any move to award PRC to Non APSTs would meet with stiff resistance. Tamin further said that we will not tolerate if the state government with taking confidence of the stake holders issue PRC the union will began several mode of protest and appeal one and all including likeminded organisation and individuals to come out to protest against the issue of any move to issue PRC which would reduce the benefits and privilege to the indigenous people of state. He also warned the MLA not to support the PRC issue in the assembly or else the people of state will give a befitting reply in comm9ing election.